Republican Congressman Tom Reed and Democratic challenger Tracy Mitrano met in a debate Tuesday night at Corning Community College. They are running for the 23rd congressional district seat. The district covers the Western Southern Tier and parts of the Finger Lakes including Ithaca, Elmira and Hornell. The debate was televised by WETM-TV. Healthcare was a prominent topic. Mitrano supports a single-payer system. Reed does not and has voted consistently to repeal the Affordable Care Act. Reed believes in a market-based system to drive health insurance costs down. The hour was interrupted several times by jeers and applause from the audience. Like when Reed attributed a position to Mitrano and called it “extreme”. To clarify, Mitrano does not support “open heroin injection sites”. She supports medically supervised injection sites as a pathway to treatment but only if a community wants one and only in cooperation with law enforcement. 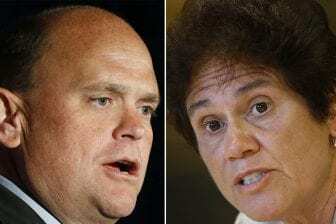 Reed and Mitrano have one more debate on Thursday in Olean.